Achieving a healthy weight and being consistent with healthy eating habits and exercise can be a roller-coaster journey. It seems that everywhere you look you hear of a new diet, or trend persuading you to try the next speedy way to lose weight. Some of these approaches may momentarily work, or if you’re lucky, they might even change your life. Many times we hear of health trends temporarily working for people because of the struggles with drastic food restrictions, or the simple fact that everyone’s body and genetic makeup is different. What if we told you that with one simple step – incorporating more fiber into your diet – you could achieve weight loss and even prevent other health conditions such as heart disease, cholesterol, diabetes and colon cancer; would you believe us? A recent study found that if you incorporate 30 grams of fiber into your diet each day you can lose weight, lower your blood pressure and improve your body’s response to insulin. This simple suggestion of eating more fiber proves to be just as effective as a more complicated diet, and will help maintain weight loss over a long period of time. Fiber is a compound that only plants contain, otherwise known as dietary fiber. Dietary fiber comes from foods such as grains, cereals, oats, legumes, fruits and vegetables. 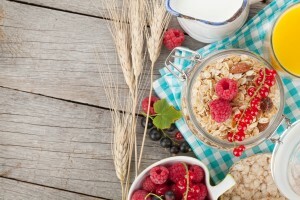 Dietary fiber is broken down into two forms: soluble, meaning it dissolves into a water-like gel in the stomach and digests slow which helps lower cholesterol and blood glucose, and insoluble, meaning it does not dissolve but stays the same all the way through the digestive system helping your body excrete. Insoluble fiber is also known as roughage. Eating too little fiber will not only lead to constipation, but it will also make it difficult to control blood sugar and hunger cravings. Fiber regulates the body’s speed of digestion and contributes to your body feeling satisfied or full. On the other hand, you do not want to flood your diet with fiber or else you will feel uncomfortable, bloated and may experience stomach cramps. It is best to get your daily dose of fiber from wholesome enriched foods and not processed grains or cereals; these are harder for the body to breakdown and digest due to their large amounts of sugar and potentially hidden, yet harmful ingredients. Consider this: on average most Americans get 12 grams of fiber per day. Health experts suggest that in order to achieve optimal health, individuals should consume 20-35 grams of fiber per day. That means the average person is missing out on anywhere from 20-23 grams of fiber that their body needs for proper digestion. What are the Best Fiber Filled Foods? Amount of Fiber: 16.3 grams per cup, cooked. Amount of Fiber: 10.3 grams, cooked. Amount of Fiber: 5.1 grams per cup, steamed. Amount of Fiber: 4.1 grams per cup, boiled. Amount of Fiber: 8 grams per cup, raw. Amount of Fiber: 7.6 grams per cup, raw. Amount of Fiber: 6.7 grams per half, raw. Amount of Fiber: 5.5 grams, raw. Amount of Fiber: 6 grams per cup, cooked. Amount of Fiber: 4 grams per cup, cooked. Nuts such as almonds, peanuts, walnuts, or pecans, and legumes such as chickpeas, kidney beans, or lentils. Everyone is on a different journey to achieve supreme health. With technology and a constant connection to the internet, one may feel overwhelmed when learning about health, nutrition and the ins and outs of weight-loss. One of the best ways to kick-start your health journey is to simply start incorporating more fiber into your diet and to focus on encouraging health habits. Share with us some of the ways you incorporate fiber into your diet. What is your favorite recipe? This entry was posted in Informational, News, Weight Loss and tagged fiber, weight loss. Bookmark the permalink.